Suzie Cool (left) and Melanie Newman were two of the four women broadcasting in the Minor Leagues in 2018. A year ago, Melanie Newman sparked Suzie Cool's broadcasting dream. The two are about to do the same for countless others. In a few weeks, Cool and Newman will take their places behind the microphones for the Class A Advanced Salem Red Sox and become the first all-female broadcasting team in baseball history. It's an arrangement that almost didn't happen. Salem's broadcasting department was headed for a change at the end of last season. Cool had just been promoted to a full-time position as the club's marketing and promotions manager after making history of her own as the first woman to be part of a Carolina League broadcast team. With the club's lead radio position opening, she approached general manager C. Ryan Shelton and assistant general manager Allen Lawrence. "I went to Ryan and Allen and was like, 'I'm just saying it would be really huge if we could get a female broadcaster, because we would be the first all-female booth,'" Cool recalled. It wasn't the first time she showed initiative. Earlier that year, Cool's first as Salem's on-field host and media and graphics assistant, she ran a similar idea up the ladder. "I don't like being complacent," said the Pittsburgh native, who entered the Minors after working for four different major and minor sports franchises and a regional sports TV network. "Because I had so many jobs in Pittsburgh, I was used to going, going, going all the time. ... There was that fear in me that I'm going to sit in Salem for nine months and nothing was going to come from it, and it terrified me. "I remember sitting at my desk one day scrolling through Twitter like, 'What the heck am I going to do?' And I actually came across Melanie's name on Twitter, and there were all these articles about her and her broadcasting and just about how amazing of a person she is. I was like, 'Wow. Why can't I be as cool as this chick?'" Newman was the No. 2 radio voice and television sideline reporter for Double-A Frisco. Emma Tiedemann had the play-by-play position with Class A Lexington. Kirsten Karbach was in her sixth season as voice of Class A Advanced Clearwater. The group comprised the only female broadcasters in Minor League Baseball. Cool wanted to join them. "I'm very proud of how we've been able to develop our front office the same way that we develop players," Shelton said. "We're looking for people to round themselves out with us and add to their skill sets and be able to move on to another situation. Suzie asking me [to join our broadcasts] was incredibly impressive. 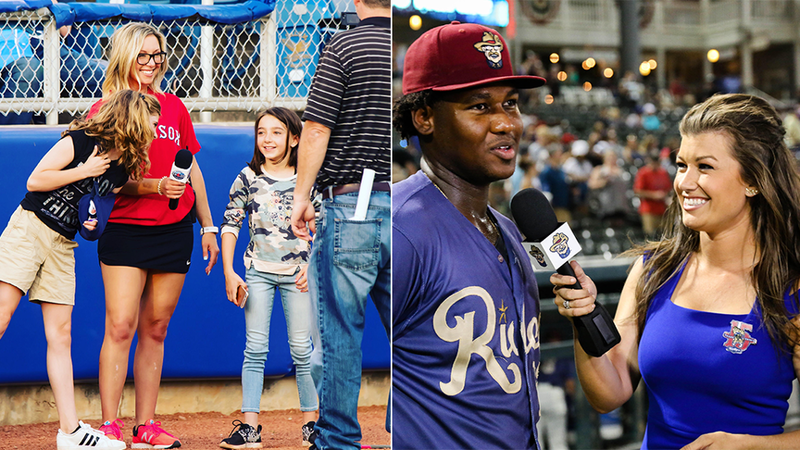 At the time I didn't realize, and was very surprised to find later, that there had never been a female broadcaster in the Carolina League before, not a primary or secondary role." Heading into 2019, the Red Sox were ready for more. Autumn is a frantic time on the broadcasting job market as radio positions open across the Minor Leagues. Salem went into its 2018 search with a new mindset. "We knew we were going to make a change in the broadcast booth, and [Suzie] asked for permission to try to recruit a female candidate and said that if we were able to do that, we would end up having the first female broadcast team," Shelton said. The Red Sox posted their open position and were inundated. "We had about 200 resumes, it feels like, in the first hour," the GM said. "Not one female. Even more with trying to bring some diversity and a different voice, we were looking for a lot of options, having someone of color, someone Hispanic, different nationalities. We were really wanting to have a more diverse voice for our fans in Salem, and we really take that approach with our front office in general. We really want our ballpark to be representative of the market as a whole, and that's not always the case. We were shocked that we weren't really able to find much diversity in the talent pool that we had." Still, the Red Sox did find Dominic Cotroneo fresh off two Carolina League seasons with Down East, but the fluidity of the Minor League job market made it a short-lived marriage. Shortly after moving to Salem, Cotroneo accepted a similar position with Double-A Corpus Christi in the Texas League. "With Dom, we were obviously very excited for the season," said Shelton, praising the bilingual Cotroneo and his plans for fresh marketing and messaging in the Salem-Roanoke market. "He did have this great opportunity to go back to his home state and move up to Double-A, and while it was a challenging time of year for that type of change to happen, it ended up being really this blessing for us." Early in February, Newman was unsure of her next step. The Georgia native hadn't applied for Salem's job the first time it was posted because there was a possibility she'd return to Frisco, but the RoughRiders made the decision to go with one broadcaster for 2019. That left Newman a "broadcasting free agent," as her Feb. 6 social media post put it. "Suzie had reached out to me the day that I announced my 'free agency' and said, 'I can't believe you're going through that. You'll find something, I'm sure of it,'" Newman said. Those words proved prophetic. The very next day, with Cotroneo's move circulating, a sportscasters' job board sent an email blast to the industry that Salem's job was likely open again. "I had over 100 emails in a half-hour once they posted it," Cool said. "It was wild. I was driving back from a [mascot] appearance, and my phone started going off. I was like, 'Holy crap, am I in trouble or something? Why am I getting so many emails?' After that all happened, Melanie actually reached out. "I freaked out, like, 'Whoa, baby! This is awesome.'" Newman threw her hat into a crowded ring, but her loaded resume stood out. As Salem narrowed candidates, Cool spoke up from Newman's corner. She remembers telling management, "The fact that this girl wants to work here, you can't pass this up with her experience." "We did an interview," Cool said, "and they loved her after that -- realized her passion and her drive behind everything, her experience with it all. She's legit." That was clear to Shelton. "We looked at a number of other candidates -- ended up with three candidates, two of whom were female -- looking for the most talented individuals," he said. "This by no means was, 'If you fill this criteria, you get the position.' We were really looking for the most talented people for it, but we were also hoping that that talent would manifest itself in a different voice and a different perspective. "It really wasn't a knee-jerk thing. It was something we put a lot of thought into, and it really started last summer with Suzie opening our eyes." Salem didn't see Newman as the most qualified female broadcaster. She was the most qualified broadcaster -- full stop -- and the Red Sox treated her as such. "The most redeeming thing to me, and I didn't realize it until about a week later, they are the first interview I have ever had for a job in this industry that didn't ask me how I'm going to cope with being in the clubhouse, being on the bus, being around the guys," Newman said. "That was the most gratifying thing in the world to me. They've seen my resume. They've called [references]. They get it. I'm a professional." The team purposefully made that understanding clear. "The pressure isn't on her, and shouldn't be on her, to not be female," Shelton said. "I took the active steps with our farm director and our coaching staff to talk through the process, and it is up to us to be able to be professional and be human beings and to understand that the broadcaster is the broadcaster. Gender really should be irrelevant. Obviously it's not, and that's why it's become a story and why we actively chose someone with intent, but at no point in time was there ever going to be a request for her to handle things differently or to have to deal with things. If there's any talk of 'boys will be boys' or 'locker room talk' or anything, that's not a factor." In late February, the decision came. The Red Sox were going with Newman. "At 27, 28, she's had a wealth of experience, whether it's on-camera, on-field or in the broadcast booth," Shelton said. "Her baseball IQ is incredibly high, her knowledge of the game. And really being able to express that knowledge from a different perspective [separated her]." Salem made its announcement on Feb. 27, and the story caught fire. It was picked up by MLB.com, Sports Illustrated and news organizations around the world. Congratulations came from baseball broadcasting luminaries like the Colorado Rockies' Jenny Cavnar, the Los Angeles Dodgers' Alanna Rizzo, the Milwaukee Brewers' Sophia Minnaert and more. "I still don't have words for it," Cool said. "I'm a really low-key, relaxed person, and I won't even lie, the first day that I saw how big -- after I saw it on Sports Illustrated -- I was like, 'Whoa, this is pretty crazy.' I knew it was going to make some noise, which is what I wanted, especially just for Melanie and I. We've both worked so hard that we deserve a big break, for people to finally see how hard you have to work to get out here. "I never thought of myself to be super excited when somebody [famous] would tweet at me or something like that, mostly because I never had that. But when I saw Jenny tweet at us or Alanna Rizzo tweet at us, I can't lie, I had a fangirl moment. I was like, 'This is huge. These are huge, iconic women in this industry. These are baseball legends.' To see that, that was pretty incredible." For Newman, the meaning of the moment was immense. "Honestly, the biggest part has been getting messages from dads having daughters who are under the age of 10 who hear about it and are like, 'I didn't know girls did that, Daddy. I think I would like that,'" she said. "That brings me to absolute tears." In an episode of "Mad Men," Don Draper gets in an exchange with Michael Ginsburg, a subordinate who's expressing discontent that Draper discarded his ideas. Ginsburg finishes his remarks with, "I feel bad for you." Draper, at his most succinct and cutting, deals a knockout blow. "I don't think about you at all." "She essentially wrote me back and told me that I needed to have thicker skin. She's prepared for it and Melanie's prepared for it. They'll be just fine. They know what comments to look at and which ones not to. Just overwhelmingly positive, so upbeat by all the positive things being said that the two percent of negative out there, they're able to ignore it." Shelton has seen one reaction more times than he'd care to. "There's a lot of, 'Well, as long as they're the most qualified. As long as they're the most talented.' They are. I can't say enough about my time working with Suzie and what she's been able to bring to our organization. My observation from afar of Melanie and what she's going to bring to the table -- they are talented. ... It is [assumed] that the male broadcaster is going to be fine, but as soon as you hire the female, it's, 'Well, as long as they're qualified.' Of course, as long as they're qualified! We're looking for a strong, talented person to fill this role and to help our organization. Our hope is that this inspires more." As at each step of their careers, Cool and Newman have dealt with criticism and insults from a segment of the public unwilling or unable to accept baseball's widening footprint of inclusion both on the field and off. Neither has time to pay it much mind. "Honestly, I expect it," Cool said. "People are going to rip on me for how I sound, how I call a game, how I don't call a game, how I look. At this point, I expect it, but I also have that same thought that those people are sitting behind their computers and have nothing better to do." Newman is focused on what's important in her first job as a lead broadcaster in the Minors. "I know the direction and level of creativity that I want to bring into a broadcast and the emotional connection that I want to be able to build with the fans [and players' families] listening back home to their kid that's a thousand miles away from them," she said. "To know that whatever direction I see fit to move this in, especially seeing how open-minded the front office executives are in Salem, it's just that whole freeing, sky-is-the-limit [feeling]. I'm holding the reins, which is slightly scary at the same time, but just the open challenge of, how do you make today's show different from yesterday's? How do you build another fan or another connection or another memory?" That's the future that Salem has embraced; one in which creative skies are the limits and their broadcasters inspire. "I think being intentional is an important step, because as our process started, we received 200 applications from white males," Shelton said. "It's very easy to say, 'Why should we actively try to hire a female broadcaster if no female broadcasters are applying for the job?' The talent pool is less. There are fewer candidates because that voice is not represented. What we're hoping to have happen is that Melanie and Suzie inspire more candidates next year so that when next year happens and teams are filling these broadcast roles, hopefully the next team isn't faced with the choice of 200 to none." That's something Cool wants to see, too. "At the end of the day, it's a great accomplishment for myself and for Melanie," she said. "But I'm hoping, truly, that it opens up MLB teams' eyes or Minor League teams' eyes to realize, 'Let's start doing this. Why not? Let's make some noise. Why did it take a small team in Salem, Virginia, and one girl's idea to make the world riot and make this happen?'"